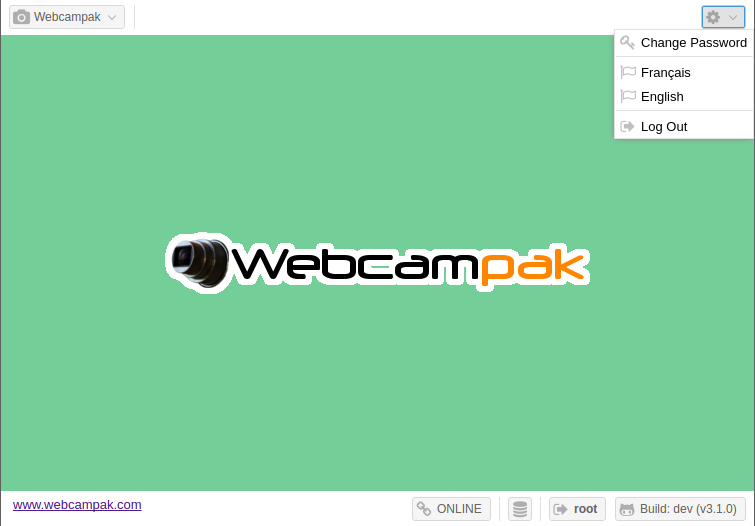 The Webcampak menu gives access to all Webcampak features and configuration screens. Those screens are detailed later in the documentation. The settings menu provides access to configuration of the desktop interface itself, such as changing the password, language or logging out of the system. Status details are provided in the bottom right corner of the screen. The first status displayed on the left side if the connection status, it indicates whether the desktop interface is able to communicate with its webcampak. This should be showing up "ONLINE" most of the time except in the case of network issues or if the Webcampak is being rebooted. Mousing over the status will also display the latency in milliseconds. This latency measures how much time it takes for the desktop interface to contact the Webcampak to obtain its connection status. The lower the better, but this number might be slightly high if you or your Webcampak are connected over high latency links (in particular satellite). The small database icon, second from the left, indicates the number of calls made to your Webcampak to retrieve or submit data. When communication happens, a number is displayed in parenthesis next to the database icon. This should only show up when an action is triggered and should clear pretty quickly. The third icon from the left is the currently connected user. Clicking on the user will log you out of the system. 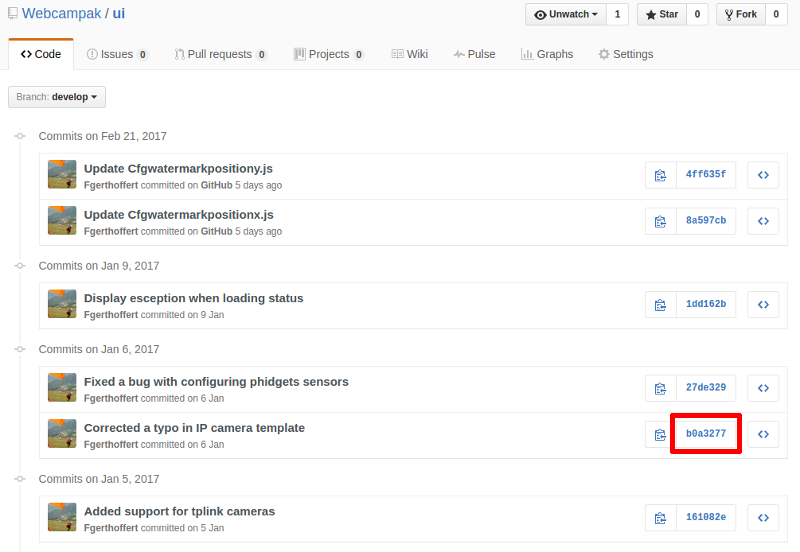 If we look a bit closer at the UI commit tag, we can find the currently deployed version in the commit history of the develop branch. It is then your call to decide whether you want to manually update to the latest version or not.